It is not widely understood that many western translations of Eastern meditative texts are heavily influenced by the Western translators’ inability to comprehend the significance of the mental silence experience. Here is a new translation of one of the most important meditation texts ever written, the 16th chapter of the Gyaneshwari. Western translators made the experience of authentic meditation sound foreign, if not frightening, however this more authentic translation makes it clear that it is a simple, natural and life-enhancing experience. I’m still trying to track down the translators that sent it to me more than 10 years ago, but while we wait for them to respond to my queries, please enjoy this profoundly important, radically different yet more accurate translation! Namdeva repeated the truth, which no yogi before Jnanadeva had ever expressed. Through these simple words Namdeva conveyed what Jnanadeva as a boy of sixteen had imparted as the most sublime wisdom of yoga, the secret of the Kundalini. 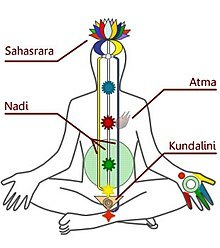 ‘The Kundalini is the primor-dial mother energy of all creation, which dwells in every human being. She lies dormant within the sacred triangular bone located at the base of our spine, in 3 1/2 coils. But when she is properly awakened she rises at once into the region of the great Void around the navel. Thereupon the Kundalini flows over the heart and into the hands and soles of the feet. There she emerges from the body as a cool breeze and manifests her powerful force. She is the breath of God in human beings. ‘This pure force of Kundalini frees all parts of the body from disease. Joint by joint she enlightens the various regions of the body and frees the flow of blood through the veins and arteries. ‘Once every cell has been enlightened, the Kundalini again permeates the whole being and fills it with divine power. At the same time she absorbs all the forces of the body into herself and only she, the pri-mordial force of life, remains. ‘Youth and age cease to exist and a pure state, existing beyond time, is born in their place. Externally the body appears as clean and pure as the body of a child, but the power of that force within is beyond description. ‘The body of the yogi possesses the radiance of gold, though it is of incredible lightness, like the wind. The mass of earth, the weight of water, he no longer carries within himself. All is thus achieved. The salt of the body dissolves itself in the water. The water is consumed by the fire within. The fire in turn is extin-guished by a cooling wind in the heart. Only this cool whisper of divine breath remains. On it the yogi is borne through all worlds, can look beyond all seas, and even understand the thought processes of an ant. He walks over water without getting his feet wet. Nothing lies beyond his reach. ‘The force itself becomes name-less, and the body is no longer of this earth, but in its perfection is raised aloft into the heavens, where it becomes a worker of wonders, without any effort. ‘The divine Breath is the reflection of the primordial Kundalini, the immaculate Goddess. She is truly the Mother of the whole Universe, the ultimate majesty of the soul. ‘In the hour of a Yogi’s death Kundalini gathers itself on the spinal column. Only the skin still covers the visible body of the yogi, who has already ceased to live in the world of the elements. He is empty and has become light. ‘Into the breath of the heart the Kundalini climbs and becomes a foun-tain of divine sounds, as it unites with Shiva, the all-pervasive divine Being. The body trembles all over with a gentle thunder at the consum-mation of this union, and the res-onance causes the opening, at the top of the head, of the gateway to sublime freedom. ‘Here at the top of the head is the region which is called Sahasrara, or the thousand petalled lotus, and in the very centre, far above the Void that spreads beneath the heart, there resides another Void, that is called Brahmarandhra, or the dwelling place of God. This entry was posted in Silence Your Mind and tagged awareness, Brahmarandhra, creation, eastern text, enlightenment, freedom, human being, kundalini, meditation, translation, western text. Bookmark the permalink. Thank you very much for posting this. Incredible that this knowledge has been relatively unknown and unheard of in recent times – it relates absolutely to your book! Very good explanation. Many thanks f or the article. For wide circulation n benefit of seekers, pl post tthis on facebook. Many thanks f or the article. For wide circulation n benefit of seekers, pl post tthis on facebook. It is better not to say a word avoid reasoning. Read and live the experience of knowing. Thanks for passing it on dear brother Ramesh. Found this wonderful treatise on the nature of death and the self by Sri Ramana Maharshi. It clarifies that the death required is just the loss of ego and that what is described here by Sri Jnanadeva is the precursor to experiencing heaven on earth in the here and now…salvation. It also clarifies what is represented by the dance of death, the Tandav, of Sri Siva, representing the overcoming of attachment to insatiable desires necessary for pure love and compassion to manifest in one’s being. ”Sri Ramana Maharshi, in response to a question, ”When you are asleep do you question whether you exist or not? It is only after you wake up that you say you exist. In the dream state also, the Self exists. There is really no such thing as a dead or a living body. That which does not move we call dead, and that which has movement we call alive. In dreams you see any number of bodies, living and dead, and they have no existence when you wake up. In the same way this whole world, animate and inanimate, is non-existent. Death means the dissolution of the ego, and birth means the rebirth of the ego. There are births and deaths, but they are of the ego; not of you. You exist whether the sense of ego is there or not. You are its source, but not the ego-sense. Deliverance (mukti) means finding the origin of these births and deaths and demolishing the ego-sense to its very roots. That is deliverance. It means death with full awareness. Thank you for sharing such great knowledge. It really helps in all walks of life I believe. Because by doing this I feel peaceful.